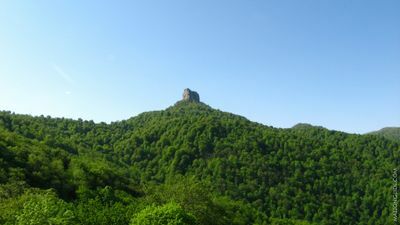 At the top of this mountain is a towering rock with Kachaghakaberd, "Fortress of the Magpies", only accessible by foot. 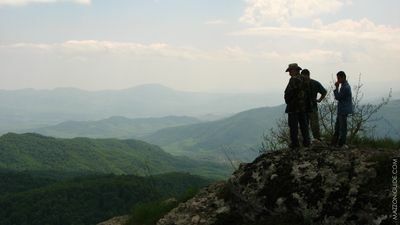 The hike is a day hike from either Kolotak or Badara village on either side of the mountain, and is along the Janapar. The natural fortifications of the rock are so great that the man-made walls are minimal, but the site and views are breathtaking. --- From the south-western slope of mountain Gevorgasar, from the village of Kolotak opens a beautiful panorama. In the distance, in front of Metsaranits Surb Hakob monastery, on top of a mountain-ridge covered with thick forest is situated fort Kachaghakaberd. Rising from dense nature and showing up against the azure of the sky this fort gives birth to real poetic images in our imagination. People called it Kachaghakaberd (magpie's fort) not without purpose, as only birds can get to its tops. On top of a very high sheer rock, there are few walls in this primarily natural fortress. In historical sources this ancient fort is also called Khachen fort. Movses Kaghanakatvatsi wrote in IXc that one of the area's princesses, Spram, after losing her husband "found masculine courage and taking along her saved daughter overcame a night's way and hid in Khachen fort". The ancient constructions of Kachaghakaberd refer to construction time of Metsaranits monastery. The cliff was fastened and turned into a fort with the purpose to protect from Arabic campaigns by Metsaranits province's owners. It seemed that the nature itself took care for Kachaghakaberd fort to be impregnable. 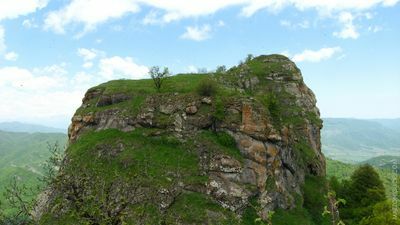 The mountain top, with a slight inclination towards south, from western, northern and eastern sides is surrounded with vertical, as if polished rocks 50-60m tall. The only weak point is the southern slope, where in ancient times was situated the entry. But even today not everybody manages to get to it, because one needs not only to go up, but to clamber by the cliff. "The not high rocks of the southern slope were once again fastened with stony walls and lime mortar. Analogous layer passed by the whole perimeter of the slope". Though from far away the fort's territory seems small, but in fact it occupies quite a large area. Here have preserved many buildings, secret passages, hollowed out in the cliffs, special gun-slots for throwing stones on the enemy. The water-supply needed a special solution. In the center of the fort have preserved two reservoirs dug in the cliff and filling with rainwater and melted water. Drinking water was most likely brought from the spring near the mountain-foot. There are number of churches in the territory of the village. All they are buried in forests. From them Yekhtsun khut, Hndzan church, Matur church, Jarunts tapen church are in good condition and are results of wonderful architectural ideas. Others are half-destroyed. The churches are mostly basilicas of 16-18cc. There are many village-territories in Kolatak's surroundings. Some of them the local people call Hndzan, Alanveran, Koharan, Beshtam, Moshi hogh, Hunoti, Tchrtapas, Mghondats Tala, Shahen Ser, Yekeghetsu khut, etc. In the mentioned village-territories remained the ruins and grave houses. Those dwellings were destroyed by Turkish despots in the end of 18c. This page was last edited on 26 October 2011, at 12:01.